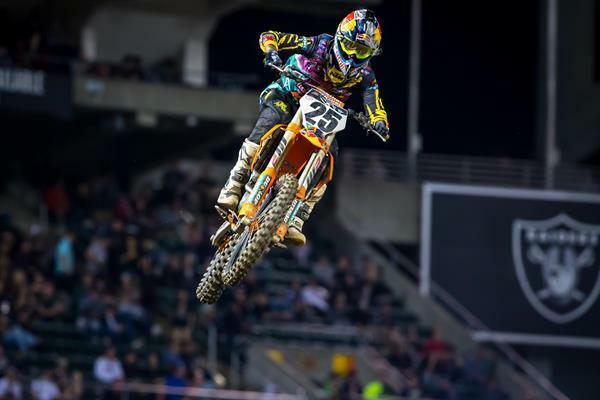 OAKLAND, Calif. – KTM factory racers earned three top-five finishes on Saturday for Round 5 of the AMA Supercross Championship in Oakland, California. In the premier 450SX class, Rocky Mountain ATV*MC – WPS – KTM’s Blake Baggett made his first podium appearance of the season with an impressive 3rd place finish, while Red Bull KTM Factory Racing’s Marvin Musquin finished 4th after experiencing a crash in the Main Event. In the 250SX West division, Troy Lee Designs/Red Bull/KTM Factory Racing’s Alex Martin captured a top-five finish in his first race back from injury since Round 1.